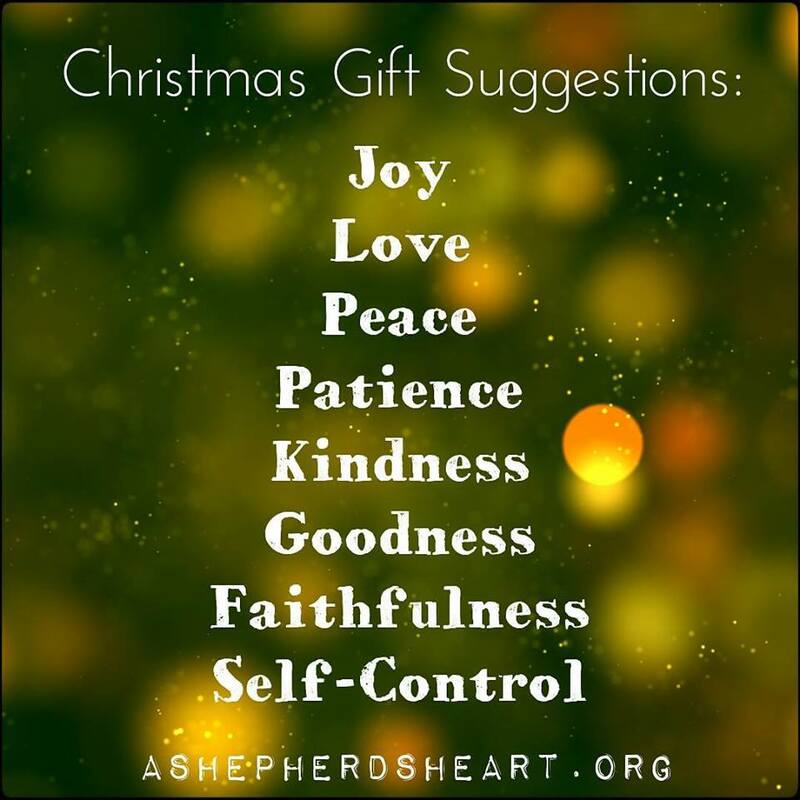 A Shepherd's Heart: Christmas Gift Suggestions from The Giver of Good Gifts! Christmas Gift Suggestions from The Giver of Good Gifts! Christmas is the season that is often called, "The Most Wonderful Time of The Year" when we celebrate the birth of Jesus and hopefully a little peace on earth and good will toward all mankind as well! I really enjoy Christmas time! I enjoy going to Christmas concerts...watching Christmas movies...enjoying Christmas music...enjoying Christmas goodies...enjoying Christmas decorations and giving gifts (not that I'm always organized in advance and kind of a last minute shopper...yes I am one of "Those". Lol) and there's much more that I love about Christmas! The problem though is that I find that we can get so caught up in the trappings of the season to the point that sometimes we focus on the gifts we can give or receive or maybe even the activities of the season and we forget The One Who is The True Gift Giver. As a follower of Christ we exchange gifts with one another because God first gave to us in the first place through Jesus' arrival that we celebrate during Christmas...The most important birthday ever!! May we remember that God is The giver of good gifts! As I contemplated the importance of Christmas again this year - God reminded me of this: That as we consider giving gifts this Christmas season, may we remember that some of the very best gifts are gifts that are given to us through and by His Holy Spirit. Thanks to these spiritual gifts, such as love, joy, peace and patience for instance, we in turn have the opportunity to share them with others as The Holy Spirit helps us express them. In other words, others benefit from God's good gifts through us! What a Christmas it would be if The Fruit of The Spirit would be seen everywhere through those who are called by His name! What a gift it would be if we all operated in the power, strength and guidance of The Holy Spirit! We cannot accomplish anything or any of this without the work of The Holy Spirit in our lives so, let's pray for each other that we will seek His help to live out and give these wonderful gifts out through how we live our lives in Jesus name I pray, Amen. PS. Encourage someone this Christmas with the truth that God is The Giver of Good Gifts! Then ask The Holy Spirit to help you grow in and express The Fruit of The Spirit for God's Kingdom and Glory!